RALC transforms lives by providing English as a Second Language instruction to adults who live or work in Richardson or Richardson ISD area. Want to learn or improve your English? By learning or improving their English, students can gain better employment, help their children in school and become more involved community members. 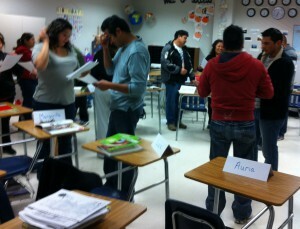 Students meet with teachers in a classroom setting at various locations in the Richardson/RISD area. English Conversation Classes are available to those wanting to practice their speaking and listening skills (beginners to advanced speakers). They are free and students can begin anytime all semester. No registration is required. New students are welcome to attend at any time. Adults only – childcare not available. “ESL for Adults” classes are semester-based English as a Second Language classes offered in the fall and spring to adults who live or work in Richardson or the Richardson ISD geographic area. This includes Richardson, Lake Highlands, parts of North Dallas and parts of Garland. Ten leveled classes are offered over a 15-week period. Two-hour classes are held twice a week in the day and in the evening at Richardson and Lake Highlands locations. New students take a placement test at registration to determine their English level. There is a $25 registration fee. Books and classes are free. “ESL for Parents” is a program offered through participating Richardson ISD schools. English conversation classes, held at the schools, are offered to parents once a week at their neighborhood school. Classes begin in September at select schools. Information about specific class dates is sent home with students in August. For more information on any of our classes, call 972-644-5119 x. 1 or email students@ralc.org.